Kurate.it uses what we call "Streams" to schedule automated emails and send your WordPress content with the power of Emma. A stream is a set of automatically recurring emails whose content can be customized according to WordPress categories, which can be sent to a specific Emma group. Emma Audience - Select the subscribers you would like to receive your weekly email. Your audience can be segments or groups. Categories - Select the post categories you would like to appear in your emails. Number of Posts - Select the number of posts that you would like to appear in the email. This is always an exact number. If you select two and only one post is new at the time the email is sent, the most recent post will be the first article in the email followed by the post from the previous day. Sends at - Select the time of day when your email will send. All times are CST in accordance with Emma server times. 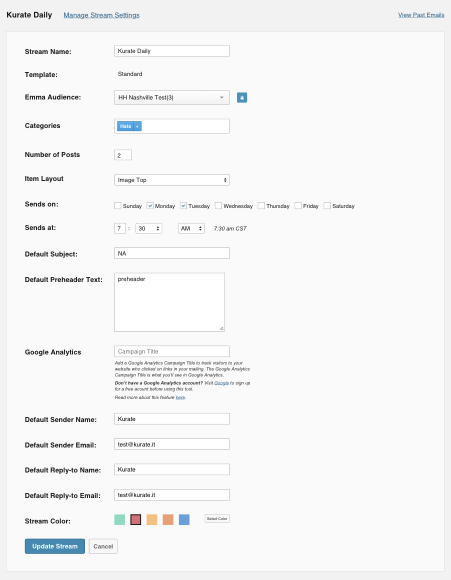 Google Analytics - This follows the functionality of Emma's integration. For more information, visit Emma's help article on Google Analytics. If you ever want to turn a stream off, move the green toggle to the left and the stream will stop sending emails. Congratulations! Streams of emails have now been configured and will be sent to your audience. You are now ready to configure individual emails (optional).